R&S has the ability to re-manufacture from sample, or from our company drawings, a number of different steam turbine shaft/disc combinations. This field of manufacturing is very precise, and we feel that our company can provide the best service without sacrificing any quality. We have, in the past, turned a complete shaft replacement overhaul around in less than 48 hours complete with metallizing and balancing. This incredibly fast service is made possible by R&S's commitment to total customer satisfaction. All seal and attached components are also readily manufactured to OEM specs or better. 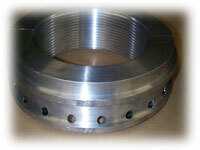 R&S specializes in the manufacturing of complex split labyrinth seals for compressor rotors with exacting precision. From a sample part that has been destroyed, we can re - manufacture to original specs. or better. All complete with material and dimensional reports.